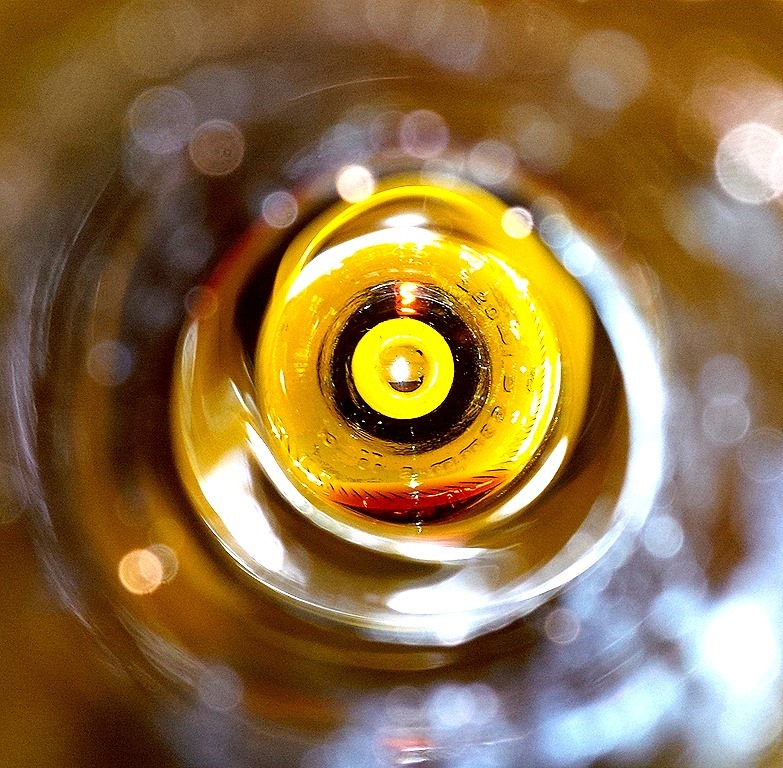 We’ve all heard the phrase “looking at the world through the bottom of a bottle”. Well I did just that and had to be stone cold sober to pull it off. I’ve been having some fun lately using empty wine bottles, cut to fit over the lens of my Cannon Digital SLR. It’s amazing what different effects you can get using bottles of different colors with different lenses and different depths of field. I shot this one however with my smart phone camera simply staring down the neck of the bottle. This entry was posted in Hodgpodge, Life Balance, Whimsy, Wine Glasses, Wine Photos and tagged Whimsy, Wine, Wine Bottles, Wine Photos. Bookmark the permalink. OK – read this back in April. Reading it again – and decided, since I haven’t found a glass-cutter, to try using my smartphone – through the whole bottle. Did a few with some wine left in the bottle and a couple with the bottle empty. FUN!!!!! Cutting glass is really simple. You can buy a simple glass cutter at the hardware store. It has a cutter on one end and a ball on the other for actually breaking the cut loose. Harder part is getting the diameter of the cut right to fit your lens. I use a caliper to get a good measure on the outside lens diameter and then transfer that to the bottle with a sharpie. Once that is done I masking tape a cutline to trace with the cutter, Score the glass with several passes of the cutter and simply tap all around the cut line until the neck breaks off. Start with light taps and increase intensity until the neck breaks away. At this point I use a file or sand paper to remove the sharp edges on the bottle. Your first posting of this technique fascinated me. I MUST try it. Will have to go the phone route until I find someone who can cut glass! Somehow, Robert, this reminds me of smoky, incense-filled rooms in the sixties. You’re definitely thinking outside the bottle. Or in the case of this photograph, inside the bottle? I spent some time in some of those “coffeehouses” in the 60s. What fun!! Love this . . . Cheers! This is beautiful Robert! Thanks for sharing.